"I Beseeched My Congressman for Army Hair Regulations"
On Tuesday, April 8th, 2014 we published an article titled U.S. Army's Controversial New Grooming Standards. This post outlined the new regulations the U.S. Army's AR 670-1 created on natural hair. Here's an update of how the mandate is affecting and offending many women in the workforce, including Dr. Kristie Mitchell. "When I read the regulation and endured words like 'unkempt' and 'matted' used to define my natural hair, I was reminded of the pain and humiliation I, too, endured five years ago before I voluntarily departed the Army." Mitchell further explains the scrutiny she received for attempting to keep her hair in a natural state and how the negativity pushed her to maintain her curls in a straight style for most of her time in the Army. That is, until she found her voice and started her loc journey. 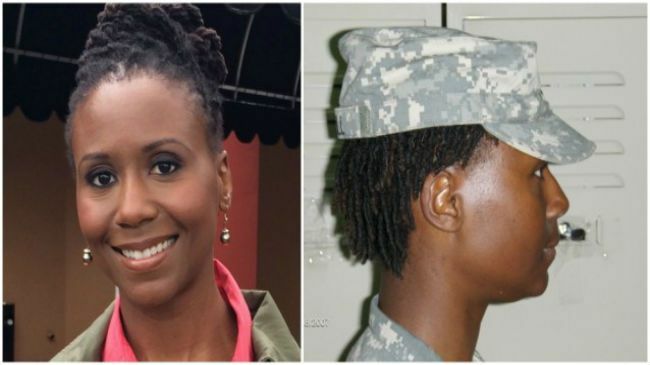 Though Mitchell felt dignified for showing off her natural hair while still trying her best to stay within the Army's then regulations, she still experienced daily changes while in combat overseas. "...I made one futile attempt to hide my locs by covering them with a wig (an authorized option). So I conceded...I cut off my locs..."
Upon returning home from war, Mitchell decided to take official action. "I filed oficial requests to change the regulation...but my efforts fell on deaf ears," she says. "It was not until I beseeched my congressman, Ciro Rodriguez, that I finally got a response from the Army." What happened next? Kristie had already left the Army before she received a response from the Deputy of Human Resources Policy Directorate. The letter addressed to Kristie spelled out how locs were in fact not a violation of the natural hair regulations of the U.S. Army. By this time, however, it was too late for Mitchell. Kristie still maintains her strong decision to leave and what emotional impact it left on the psychiatrist. She applauds the high standards the United States Army holds for grooming and hygiene, but "it must recognize that the Caucasian hairstyles these regulations are based upon are not the only ways to achieve this professional, hygienic appearance...This is a toll no other group in the Army must pay."